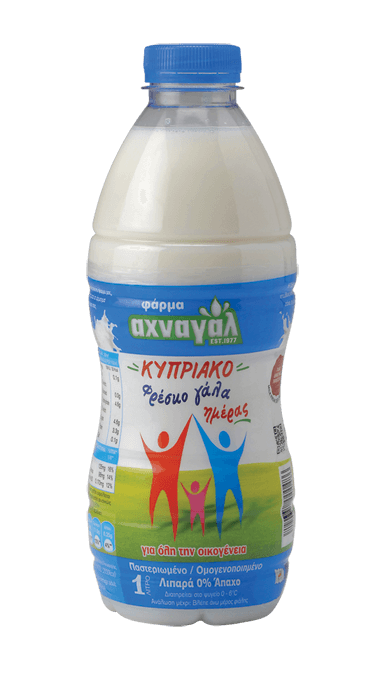 We produce 100% Cypriot fresh milk daily in our privately owned cattle farm, Eleftheriou Brothers Ltd, with the sole aim of offering clean, safe product for our dairy production needs. Our fresh milk reaches you daily, within hours of being produced, to accommodate your family’s nutritional needs enabling you to lead a healthy life. Achnagal, Fresh daily Milk, 3% fat, available in 1lt, 1,5lt, 2lt plastic bottles. Nutritious and delicious fresh milk that encompasses all the necessary trace elements, minerals and vitamins. Achnagal, Fresh daily light Milk, 1.5% fat, available in 1lt, 1,5lt, 2lt plastic bottles. Nutritious and delicious light fresh milk that encompasses all the necessary trace elements, minerals and vitamins. Achnagal, Fresh non-fat daily Milk, 0% fat, available in 1lt plastic bottles. Non-fat milk that encompasses all the necessary trace elements, minerals and vitamins yet remaining delicious. Achnagal, Lactose free fresh daily light Milk, 1% fat, available in 1lt plastic bottles. Nutritious lactose free fresh milk that encompasses all the necessary trace elements, minerals and vitamins while remaining easy to digest. Achnagal, Fresh light Goat’s Milk, 1.6% fat, available in 0,5lt plastic bottles. Nutritious and delicious light, fresh goat’s milk that encompasses all the necessary trace elements, minerals and vitamins. Ideal for people intolerant to cow’s milk.